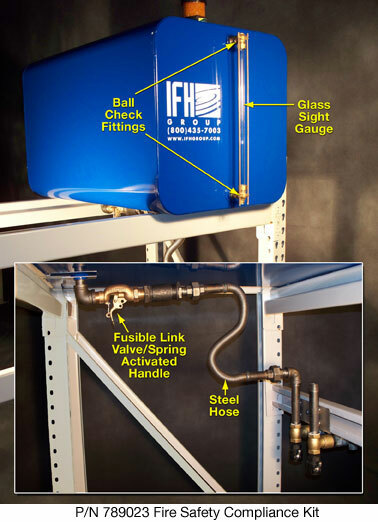 For applications involving corrosive chemicals that may damage the standard PVC hose, IFH offers the Special Product Package. The standard PVC Sight Gauge on the front of the Containers is replaced with a Glass Sight Gauge equipped with Ball Check Fittings at both ends. Underneath the containers are 3/4″ NPT fittings and Flex Steel Hose. For users who need to be in compliance with strict fire safety regulations, IFH offers the Fire Safety Compliance Kit. The standard PVC Sight Gauge on the front of the Containers is replaced with a fire-resistant Glass Sight Gauge equipped with Ball Check Fittings at both ends. 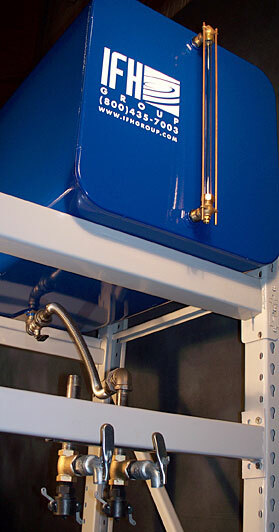 Underneath the Containers, the standard PVC hose is replaced with 3/4″ NPT Fittings, Flex Steel Hose that connects to a Fusible Link Valve with a spring-activated handle. If the temperature reaches 165° F (73.9° C), the handle is automatically triggered and shuts off any possible leakage of fluid from the Container.